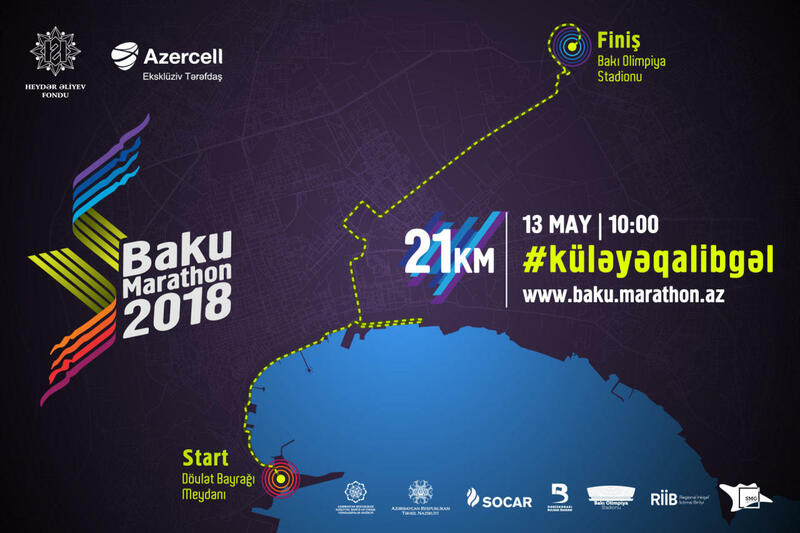 Baku Marathon, initiative of the Heydar Aliyev Foundation, returns for 2018 after a successful inauguration in 2016. Being held for the third time, this year’s Marathon retains its motto: Win the Wind. This year the rally will be held at the on May 13. With its major goal of promoting sport, healthy lifestyle and bringing people in their pursuit of good intents, the Marathon will be organized by the Administration of the Seafront Boulevard along with the Baku Olympic Stadium, and Sport Marketing Group (SMG) acting as the executive agency. The exclusive partner of the Baku Marathon-2018 is Azercell Telecom. This year’s semi-marathon is open to anyone above the age of 16 upon prior registration. Registration for the Baku Marathon 2018 is available either at Baku’s shopping malls (“28 Mall”, “Ganjlik Mall”, “Port Baku Mall”) or at www.baku.marathon.az website since March 5 until May 5. The registration procedure requires filling out an application form, presenting a copy of valid ID (student ID in case of students) and paying the admission fee. Volunteers of the “One” Student Volunteer Program of the Ministry of Education will assist the applicants at the checkpoints. Individual fee for individuals is 20 manats ($11), whereas corporate fee (minimum 5 representatives from an agency) is 100 manats ($58) per person. As the expenses for students’ participation are covered by the Heydar Aliyev Foundation, no fee will be charged on students in the course of registration. Awards for the Baku Marathon 2018 will be granted in two categories: the first three places among men and women. Winners of the first places in both categories will be awarded 3,000 manats ($1,764), whereas the second and third prize winners are to get 2,000 ($1,176) and 1,000 manats ($588) respectively along with gifts, medals and certificates. Moreover, the winners ranking 4-10th among men and women will get various gifts from sponsors. Volunteers supporting the marathon and all participants will be awarded with certificates by the organizers. Additional information on the developments and events related to the Marathon is available at the Baku Marathon 2018 Facebook page (www.facebook.com/bakumarathon) and the www.baku.marathon.az website. For additional information please call: (+99412) 310-13-31.